Timber Decking is becoming very popular and there is no shortage of different designs as there are very few restrictions. 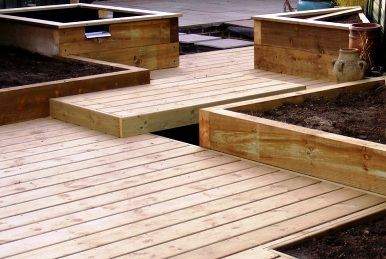 We offer a full design, supply and installation service on all types of decking available from softwood to hardwood, ground level to raised level. Timber decks can also be surrounded with Panels, Balusters and Spindles to create a unique personal design. No two timber decks are the same and with components available to meet most requirements, all shapes and sizes are possible.